Logsearch is the opensource project I lead as part of my day job at City Index Ltd. Based on the Elasticsearch ELK stack; and packaged as a BOSH release, it builds you a log processing cluster tailored to making sense of your IT environment and the apps that run on it. I gave a talk showing how Logsearch can be used to analyse the logs of a Cloud Foundry cluster at the London PaaS Users Group last week that was well received. The new breed of PAAS systems are all converging on a common deployment model. A CLI tool uploads your code / executables to the PAAS. The buildpack bin/detect ‘s whether it knows how to work with your code type (eg, it looks for a Gemfile, or a .java class). If no, it fails. The buildpack bin/compile ‘s your code, combining it with any runtime dependancies – i.e a specific JVM or Mono runtime – and any related libraries – eg, what is specified in your .nuget package or Gemfile. This process basically results in an “app” folder which contains all the binaries your app requires to run. All of this output is then zipped up into your app.tgz and added to the PAAS blobstore. That done, the staging container is deleted. The PAAS monitors your start command – if it exits it will automatically rerun step 4 to give you a fresh runtime container. The PAAS also monitors the host machines running the containers – if any of those fail it will restart all the affected runtime containers on a new host machine. This step happens more frequently than you think (typically nightly), because its also the way that the PAAS keeps the host systems operating systems updated. Each PAAS (Heroku, Cloud Foundry, flynn.io) has custom components that orchestrate everything, but there is a healthy open source community creating buildpacks for the languages and runtimes near and dear to their hearts; and these typically work (with minor modifications) on any of the PAASes. In the event of a catastrophic failure you the container (and its logs) get deleted before you can extract any of the files. So, my holiday project was to try and build something to make debugging the deployment process easier. 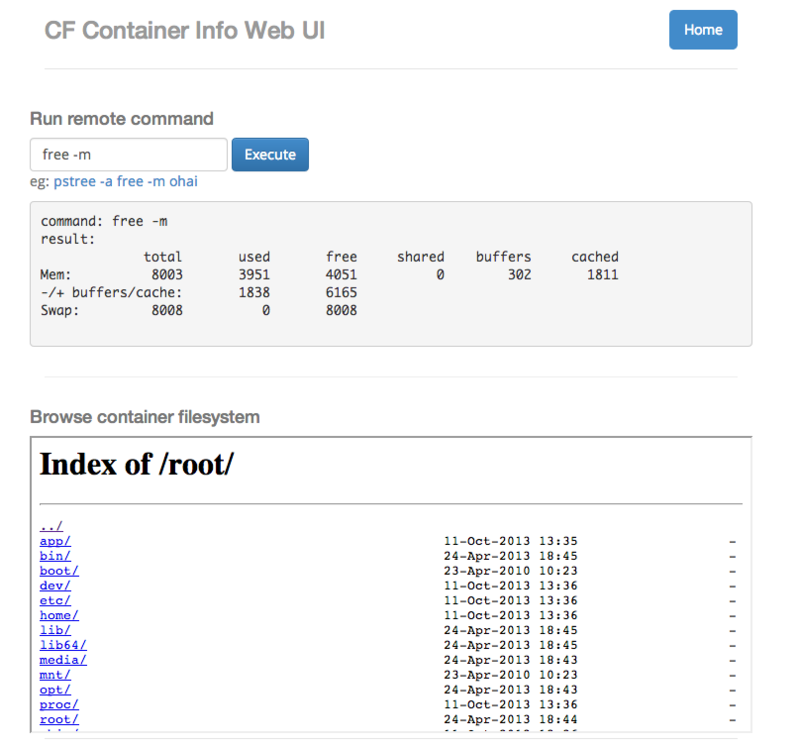 The result is https://github.com/cloudfoundry-community/container-info-buildpack – a buildpack that exposes information about the staging and runtime containers via a web-app. See the README.md for details on how to use it. This little experiment has been received with enthusiasm by the CF dev community; so I think I’ve identified a common pain point. pstree -a <- lists all the processes currently running in your shell. openresty <- a collection of nginx modules that turn nginx into a simple (and very efficient) app server, with the ability to script logic using LUA. Re-run the staging and runtime processes without having to redeploy your app. The AMEEConnect API gives access to a vast amount of climate related data. It also exposes standardise methodologies and to perform calculations based on that data. 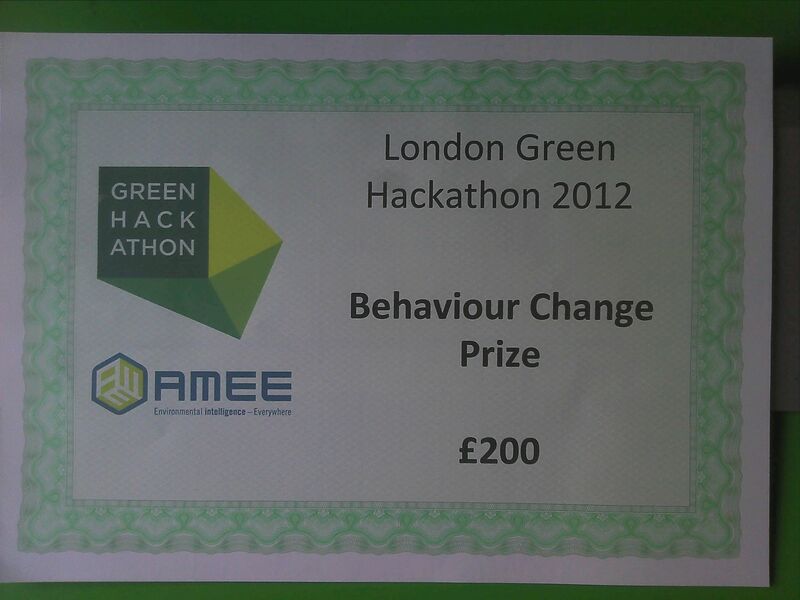 As part of the London Green Hackathon I created the AMEE-in-Excel addin to tightly integrate this data and calculations into Excel. So, if Excel is your preferred way to work with climate data, then this should be in your toolkit. All code is open source and hosted at . Pull-requests are welcome! We believe over 80% of the sustainability field currently use spreadsheets. As a process, this is broken, not scalable and inaccurate. 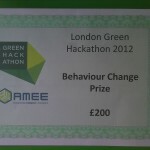 AMEE in Excel Integrates spreadsheets with web-services, to create a behaviour change that could address this issue and bring more credibility to the market. During June 2011 I presented a session at the SPA2011 conference in London, UK. Judging by the feedback I received, the session went very well. People seemed to like the hands-on format of the session; and just being left alone for a while to learn something at their own pace. Implementing the strategy pattern without an explosion of classes – part 3 of ?? I feel uncomfortable when I see large switch statements. I appreciate how they break the Open Closed Principle. I have enough experience to know that they seem to attract extra conditions & additional logic during maintenance, and quickly become bug hotspots. A refactoring I use frequently to deal with this is Replace Conditional with Polymorphism; but for simple switches, its always seemed like a rather large hammer. This explosion of classes containing almost zero logic has always bothered me as quite a lot of boilerplate overhead for a relatively small reduction in complexity. In this case the whole file starts to feel too complex to me; and having the logic partitioned into separate strategy classes / files seems more maintainable to me. To conclude then, the fact that languages treat functions as first class constructs, gives us the flexibility to use them in a “polymorphic” way; where our “interface” is the function signature. 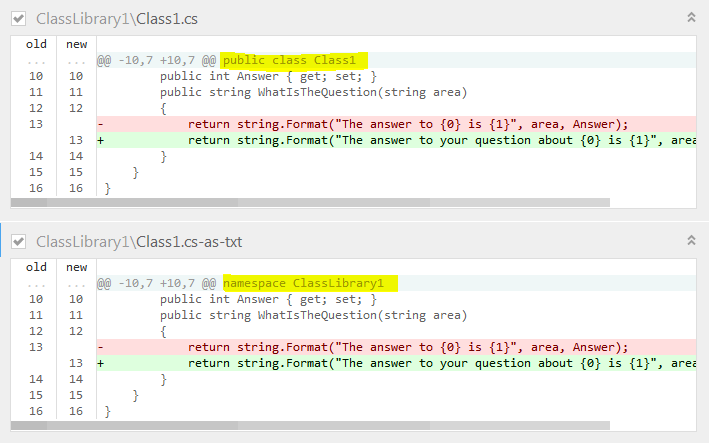 And for some problems, like a refactoring a simple switch statement; I feel this gives us a more elegant solution. Its a bit rough; so please fork and contibute back improvements. The FlexMojos project is a great way to bring your Flex application under a grown up continuous build system like Maven. Getting FlexMojos 3.6.1 working with Flex 4, running Flash Builder 4’s version of unit tests and FlexMonkey4’s version of acceptance/UI tests is pretty tricky. Hopefully this sample project – http://github.com/mrdavidlaing/flexmojos-sample along with this screencast will save someone else the pain I went through to get all these playing together. Howto add new component to FlexITP from David Laing on Vimeo. Patches welcome – just clone the git repo make your change, and request a pull.